Wordy Wednesday…Technology, ain’t it grand? It’s time to face the truth, folks. Technology runs our lives! From checking my bank balance and depositing a check from my phone this morning, getting a recipe for dinner on-line, and checking in with an old friend on Facebook, we cannot deny how much we use or rely on it for our daily lives. Before I had kids I was always like, “I will never let my kids watch movies in the car,” or “my kids will never be allowed to play games on my phone…” etc., etc., etc. Now that I have two boys, 6 and 4, I can safely say, I had no clue what I was talking about 🙂 We have a DVD player in our van, a kindle my kids use all the time, and sometimes I can’t even find my phone because they were the last ones to use it. If technology is firmly embedded into our lives, just imagine how it is for our kiddos! Growing up with all of this as the norm, readily available for people to use virtually anytime, anywhere. Contrast that with my childhood, (and I’m definitely going to be dating myself here), where we didn’t even have a remote control for the TV, got dial-up internet when I was in college, and didn’t even get my first cell phone until I was 24. Seriously. So, the link between technology and our daily lives especially for our little ones is there. For kiddos on the autism spectrum, technology can be a great reinforcer, way to help them communicate, teach social skills through stories, and on and on. The main hinderance for a lot of families is the cost. Tablets, smartphones, computers, they are all crazy expensive. With a lot of families shouldering a lot of the cost of therapy and interventions for their kids on their own, it’s not possible for them to purchase “luxury” items like tablets, even if it can be a huge help. That’s why today I wanted to share some info about programs to help make tablets more affordable for families with kids who have been diagnosed with ASD. clicking the button that takes you to this link. 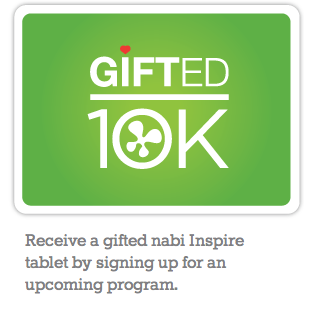 There is also an amazing program to apply for a free nabi tablet and case. 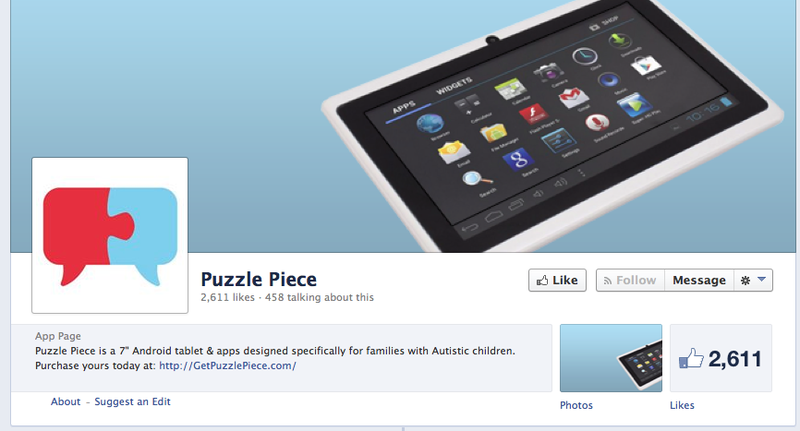 Families with kids on the autism spectrum can apply by following this link. Families of ASD kiddos can purchase a reduced price 7″ Android tablet for $19 and subscribe to a monthly app service for $20. Each month, they will receive 10 different apps for autism, and families can cancel the monthly app service at any time with no contract. The tablet is yours to keep regardless if you keep the apps for only one month or a year. Follow the link at http://GetPuzzlePiece.com/ to learn more. 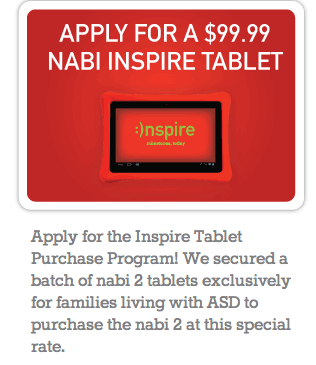 We have applied for the nabi free tablet and will be applying for the reduced price tablet if we don’t qualify. My husband and I are thinking of purchasing the Puzzle Piece tablet since the price is so reasonable and checking it out. I don’t have any vested interest in any of the programs, but just wanted to pass on the info. Let me know what you think! Have you tried any of these programs? What are your experiences? Do share! Have a great one! This entry was posted in Wordy Wednesdays and tagged ASD, autism, autism apps, deals on technology for autism, kids with special needs, nabi inspire tablet, puzzle piece, technology for autism. Bookmark the permalink.